The core of the Bedford Museum collection originally came from Bedford Modern School. They had their own museum when the school was still based in the heart of the town centre, behind the Edward Blore designed facade that now fronts the Harpur Shopping Centre. The museum was on the first floor, roughly where Boots now stands and displayed a collection of weird and wonderful curiosities, as well as collections of Natural History, Social History and Archaeology. 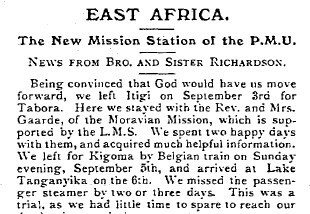 Spanning several pages, the article was an account of 'Brother' and 'Sister' Richardson's journey across Africa to Kalembelembe where they would set up a new mission station. They were a devout couple who clearly felt strongly about their faith, and saw every trial they faced as God's will in some way. They were dismayed by the ritualistic practices they found in the village that differed so greatly from their own beliefs and urged the readers of their letter to pray for them in their work. I felt I had found the source of the collection - these were the only British people in this Village at the right time, and their name matched one of the two possibilities provided by our records. But why had their collection ended up in Bedford? Bedford was mentioned within the newsletter, but only as a donor of funds in a long list of subscription gifts from towns all over the country, certainly not a firm link. 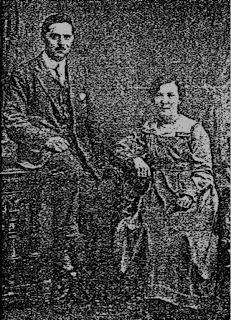 Even with the full name of Arthur William Richardson I could trace nothing to connect him to the town or school, and the newsletter had been published in Sunderland. I recalled that our collection of Palestinian archaeology came from a man named William J.J. Glassby, I didn't know much about him other that he had kept his fine collection, which included artefacts excavated by the famous pioneer achaeologist Flinders Petrie, in a Mission building in Costin Street, Bedford, before it was donated to Bedford Modern School Museum in 1932. Could this Mission Hall be the connection? I searched again, changing my terms to 'Pentecostal Missionary Union' and 'Bedford'. This hit the Google* jackpot. Numerous references came up mentioning both terms, and a man called Cecil Polhill-Turner. It seems that Polhill (he dropped the Turner as young man) was a Bedford man who had inherited the estate of Howbury Hall near Renhold along with a large sum of money. He was part of the 'Cambridge Seven', a group of born again Christians who joined the China Inland Mission and dedicated their lives to missionary work. He was also the president of the PMU, bankrolling many of the missionary journeys and partaking his of own in China and India. The Confidence pamphlet was the official voice of the organisation until founder member and editor of Confidence A.A, Boddy split with the PMU over differences of opinion. Confidence continued to promote their missionary work edited by Boddy but the official voice now came form Flames of Fire, a monthly newsletter published in Bedford and edited by Cecil Polhill's estate manager, none other than William Glassby. 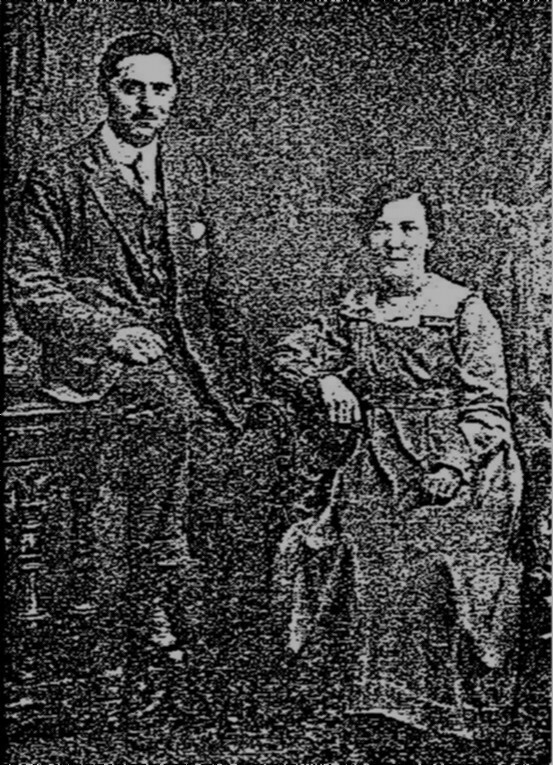 Further research through the several years worth of issues of Confidence revealed that Arthur Richardson had died in 1925 of Blackwater fever, though his wife and child remained in Kalembelembe for a period afterwards. I then turned back to the Eagle magazine to see if there was anything I had missed in the article referring to the donation of the Richardson (though cited as Robinson) collection. There was: the first paragraph that introduces the school museum section said that the Palestinian antiquities collection had in fact been donated by Cecil Polhill and '94 subscribers' in memory of Glassby; then under a section titled 'Gifts' it listed 'The Glassby Collection' in detail, immediately followed by 'The Robinson Collection'. It seems very likely that the PMU had received collections from Richardson's wife and those may have been stored with Glassby's 'Missionary Museum' in Bedford. When Glassby died and it was decided to send his collection to the Bedford Modern School museum,it must have seemed a logical place for the Richardson collection to go too, as there was already a strong collection of ethnographic artefacts in the museum. I'll continue researching the connections, while also looking at other donors, with the 'Hillman' collection of Chinese artefacts another similar conundrum. Any memories or information anyone might have of family members having donated ethnographic artefacts to the BMS museum between the 1890s and1940s would be very gratefully recieved! *Other search providers are also available. While browsing through photos in our social history collection a picture jumped out at me - a couple with a child who looked very familiar. Could it be Arthur Richardson? I compared it to the very grainy image from Confidence above an the man certainly looked similar, but a moustache and short hair in the 1920s is a fairly common look. I was far more convinced when I compared the images of the woman. Now after looking at them for a while I am certain this is the Richardson's and their young boy. The picture had no details with it as it had been separated from the African material and had only been accessioned in 2000 with a number of other photos which had been in our archive. The Bedford Modern School Museum had many as yet unprocessed objects, some we are still identifying today. The work goes on.